Boasting electric start, automatic transmission, and parental controls, the YFZ50 is perfect for riders 6-years-old looking for the perfect entry-level sport performance ATV. SPORTY CHASSIS: Single I-arm front suspension is tuned for light, easy steering and comfortable ride quality. The rear swingarm also features a compact single shock rear suspension for good control and comfort. And the entire package includes awesome YFZ-derived sport ATV styling. COMFORTABLE ACCOMMODATIONS: The YFZ50 is designed to be comfortable and accessible for new ATV riders. With its roomy ergonomics, plush seat and wide floorboards, riders 6 and up won’t outgrow the machine before they’re ready for more displacement when they’re older. OPTIMIZED TIRES: Duro® low-profile tires, AT16 x 6.5-7 front and AT16 x 7-7 rear, give YFZ50 aggressive looks and sporty handling. SECURE STOPPING POWER: For reliable stopping power, three sealed drum brakes bring the YFZ50 to a secure stop. There’s a handlebar-mounted parking brake, too. ENGINE LIMITER AND TETHER SWITCH: To help young beginners grow into accomplished ATV riders, the YFZ50 includes a two-stage rpm limiter as well as a throttle limiter to restrict the engine’s performance and adapt to the rider’s advancing skill levels. A tethered switch allows parents to closely monitor new riders and cut power to the engine if necessary as new riders learn the basics of ATV control. ROBUST 49CC ENGINE: The 49cc four-stroke SOHC engine is tuned to develop excellent low- to-mid-range performance, just where it’s needed. The motor is air-cooled for simplicity, performance and long engine life and it uses ultra- reliable wet-sump lubrication. ELECTRIC STARTER: Push-button electric starting comes standard, powered by a reliable sealed battery, and a kick starter is provided for additional peace of mind. AUTOMATIC TRANSMISSION: Fully automatic, continuously variable transmission (CVT) means no shifting. Handy for all riders, it’s a feature new riders will particularly appreciate. SPORTY DRIVETRAIN: Engine power is transferred to the rear wheels via a robust O-ring chain drive, running along a swingarm that’s set at an optimized angle for rear shock performance. LOW MAINTENANCE DESIGN: Servicing is easy, thanks to features like the tool-less quick-access air filter element. The exhaust includes a standard spark arrestor as well. MODERN, RELIABLE ELECTRONICS: The CDI system means reliable ignition performance, with a strong, efficient spark, and a sealed, maintenance-free battery gives worry-free service. YAMAHA SPORT ATV DNA: The YFZ50 offers the same sporty looks as the rest of the YFZ family, for exciting sport ATV style. 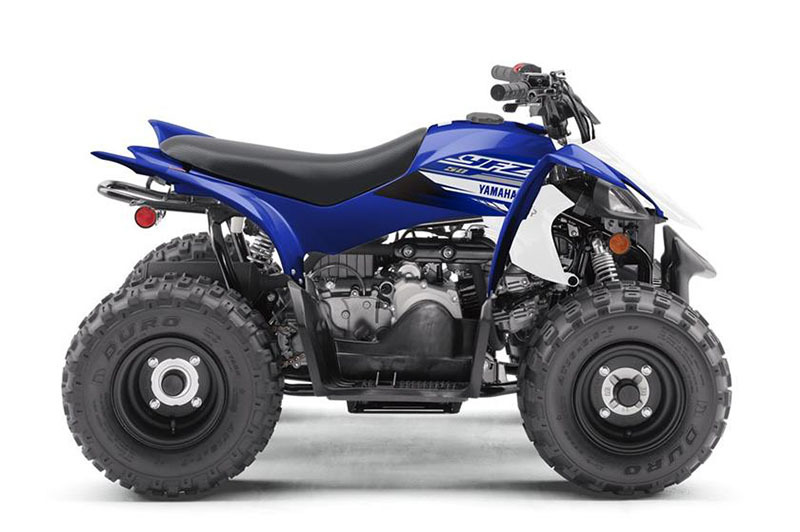 BEGINNER-FRIENDLY FOUR-STROKE PERFORMANCE: The YFZ50™ is engineered as the ideal starting point for aspiring ATV riders aged 6 and up, with a low-maintenance 49cc engine tuned to develop responsive, controllable performance. A combination of engine limiters and a power cut-off tether switch make it easy to allow young riders to adapt to the ATV as their skills grow. SCALED DOWN, NOT SCALED BACK: Single I-arm front suspension is tuned for light, easy steering and comfortable ride quality. The rear swingarm also features a compact single shock for good control and comfort. It also boasts convenient features like a fully automatic CVT transmission and electric start with a back-up kickstart. COMFORTABLE CHASSIS: A robust steel frame design incorporates a large 1.5 gallon fuel tank, plush seat and roomy integrated floorboards. 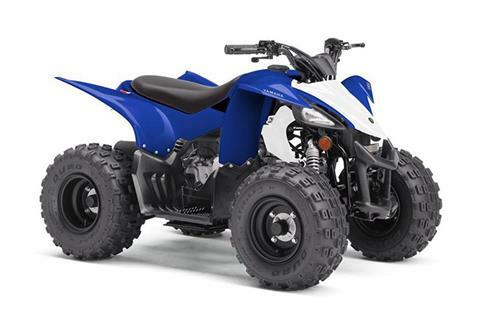 YAMAHA SPORT ATV DNA: For sporty looks and handling, YFZ50 uses durable Duro® tires on lightweight wheels, with styling unmistakably inspired by the race-ready YFZ450R™.